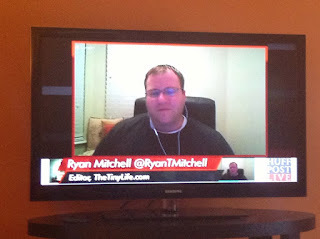 On Tuesday, I got an email from my friend Ryan Mitchell of The Tiny Life. He was going to be on HuffPo Live talking about tiny houses and needed a couple of additional people to participate. I was unable to join but I was excited to see Dan Louche of Tiny Home Builders and Logan Smith of Smalltopia answer the call. 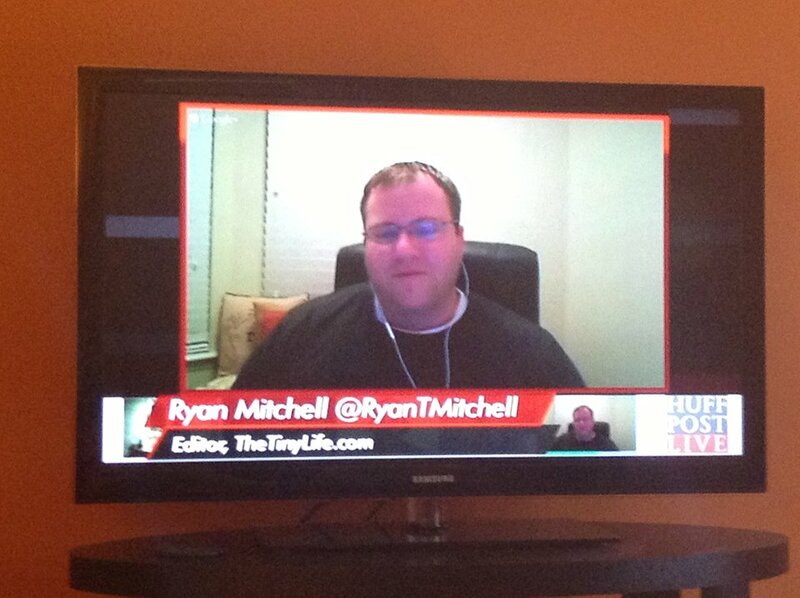 Of course, Ryan Mitchell himself was on the call along with Gregory Johnson of the Small House Society. Like with much of the media coverage on tiny homes, the presentation was a mixed bag. While our the tiny house interviewees represented themselves quite well, the online comments were often less than gracious. The moderator did his best to ask only the most respectful questions but it wasn't always possible. For instance, at one point the question "Why don't you just live in an RV?" came up. I always thought this was a rather strange question to ask. I mean - if wanted to live in an RV I would. Asking that question really misses the point of the tiny house movement. But do check out the interview for yourself. I am glad to see so many great representatives from our community online talking about their own experiences. I think asking "why not an RV" is a really logical question. The answer may seem obvious to anyone who cares about aesthetics, but a large percentage of the TV audience is going to be asking the same thing, so it's a good question from the interviewer's point of view. And it opens up the discussion to how tiny houses differ from RVs, which makes for an interesting conversation. Personally I may get "why not an RV" but I still like to hear what others have to say on the issue! I live in an 'RV'. Perfect for a single person on a very tight budget but you really do need more storage space than even the best RV can provide. I've lived 'tiny' now for 8 years. You don't need a seperate bedroom but you do need something more than a 'dormitory room' sized fridge. Preferably something with a seperate freezer compartment. Whether tiny house or RV trailer/motorhome, I'd recommend a fly-roof over it to protect it from the sun,rain and hail. This larger roof is perfect for rainwater collection. I enjoyed the interview and I was excited to see the various people who have chosen this lifestyle, especially Ryan Mitchell because I've been reading his blog along with yours. You're all an inspiration but also, truth be told, a curiosity. What a radical choice after all the social conditioning and messages we've received to go bigger, spend more, and pursue convenience! Cheers to all of you for being so bold and blazing a new trail!